"Corn. Why does the word 'corn' mean so many different grains? Because 'corn' originally meant any small particle -- even sand or salt. That is why beef preserved by the use of salt is called 'corned beef.' When 'corn' finally came to mean a certain type of grain it was used to refer to the grain that was the leading crop of the locality. In England, therefore, 'corn' is wheat; in Scotland and Ireland, 'corn' is oats; and in the United States, it's maize. "Gargoyle. 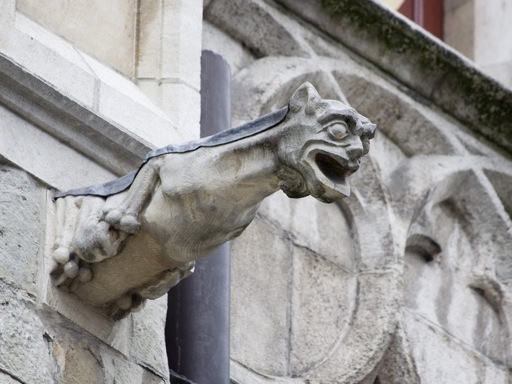 Does the word 'gargoyle' refer to the appearance of these images? "Kid. What is the reason we call a child a 'kid'? "Necking. From what did the word 'necking' get its current meaning? "Salary. Where did we get the word 'salary''? "Umpire. Where does the word 'umpire' come from? From the Old French word nompair, meaning 'not paired.' The 'umpire' is the third or 'not paired' person called upon to decide between two contestants." Copyright 1985 Book Sales, Inc.